“Behold, I stand at the door, and knock: if any man hear my voice, and open the door, I will come in to him, and will sup with him, and he with me.” Do the needful today and be blessed in Jesus’ name. OMG! This is a big Question! Thank you Aunty, this poem is wonderful! Only your grace will save me from this troubled world, oh Lord, nice piece. The flesh is weak but the Spirit is willing, God help us. What is needed is onky a step of faith and God's grace will take over. This is a poem with a call to repentance. God gives chance but it sure runs out and I pray we all repent before it is too late. so many times you have called and so many times we have rejected you...God forgives for taking your love for granted and give us the grace to answer when you call..
What then shall I say, shall I continue in sin that grace abound? 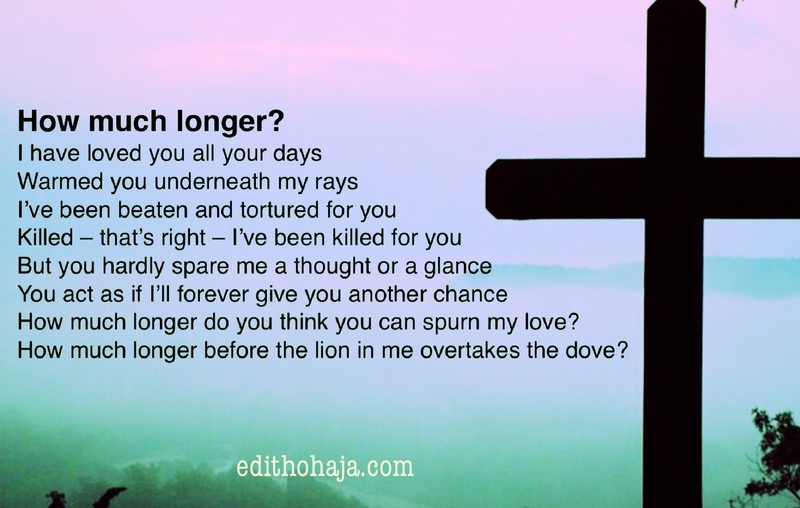 Please father may you not go far from me and may the lion in you never overtake the dove in you. Many have answered rightly and I too. But the violent passions of the flesh and of the world is too tremendous. God's grace for us. God's grace, that we may not fall back. I will ever day "hold my hand, Jesus". Hmm! It's indeed a very crucial question. Father have mercy on us. we need more of you, your grace, and the strength to serve you for the rest of our lives. We are now in the era of grace.let us not misuse this grace of God because a time will come when grace will be no more. We have grace in abundance, its ever sufficient for us but misusing it is totally wrong, the earlier we realize the better it is for us. There is nothing more painful than having a map but yet going the wrong way. Grace is sufficient but shall we continue in sin that grace may abound?? Of course not! All we need is just wisdom and a willing spirit. God help us all. Beautifully written,couldn't help the tears that came later. Aunty Edith you're just the best spiritual tutor ever.